Bridgette Mayer Gallery's summer group show of the works of eight artists, "Young and Fun: Abstraction," lives up to its title. Clara Fialho's paintings announce a carefree mood immediately. The Brazilian artist brings the same expansive joie-de-vivre to her tiny paintings that she brings to this show's largest painting, an explosion of colorful drips and marks on a hazy yellow background that suggests the smoky aftermath of a carnival. Arden Bendler Browning also steals the show with her hyperactive abstractions of urban environments that call to mind a collision of Eric Fischl, minus the figures, and Richard Diebenkorn's abstracted landscapes. Federico Herrero's monumental painting, "11:11 A MI" (2009), defines fun abstraction with its bright, awkward blocks of color, although I would have liked to have seen a more recent work. Laura Watt makes a strong impression with her paintings of patterns inspired by Arabic tiles, Amish quilts, Buddhist mandalas, Pygmy bark clothes, and Scottish tartans. As much as I like the Scottish artist Graeme Todd's mysterious landscapes, I was too quickly reminded of Peter Doig's paintings. "Young and Fun: Abstraction" also includes works by Alejandro Diaz, Nathan Pankratz, and Rebecca Rutstein. 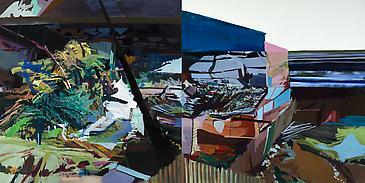 "Galleries" by Edith Newhall and "Art" by Thomas Hine appear in alternating weeks.